This year, in honor of the 400th anniversary of the death of William Shakespeare (on April 23, 1616), the Folger Shakespeare Library has organized an extraordinary tour of First Folios from the Folger collection to all fifty states. Steve Grant, author of our widely-admired Collecting Shakespeare: The Story of Henry and Emily Folger, has undertaken an similarly ambitious speaking schedule that will take him to several of the hosting libraries, museums, and institutions participating in the tour. We’ve invited Steve to provide regular updates as he follows the First Folios around the country, speaking about their important literary and cultural history the extraordinary legacy of Henry and Emily Folger. On display in the New Mexico Museum of Art during February, 2016, Shakespeare’s First Folio open to the “To Be or Not To Be” speech in Hamlet. Partnering with St. Johns College in Santa Fe, the New Mexico Museum of Art won the competition to host the First Folio Exhibition from February 5 to February 28, 2016. While the Folger Shakespeare Library in Washington DC––only two blocks from the U.S. Capitol––required that host institutions organize at least FOUR events during the exhibit, the Museum arranged FORTY events. One event was the Shakespeare Treasure Hunt. Youngsters picked up a free treasure map and followed clues based on quotations from the Bard that led them downtown to declaim the lines to local merchants. Visitors from the London Academy of Music and Dramatic Art put on a workshop on the breath, sound, and articulation on Shakespeare’s sonnets, including practice in reading Shakespeare out loud. The Museum organized a day of love and art where participants created cards, heart ornaments, and Valentine’s Day collages inspired by Shakespeare. Director of the Palace Press at New Mexico History Museum in Santa Fe, Tom Leech, demonstrates a wooden hand press like those used in early 17th century England. 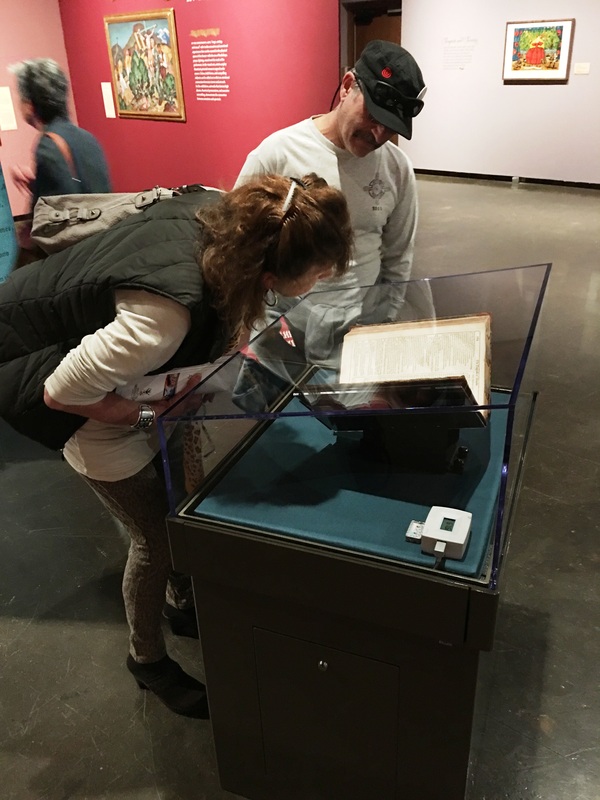 Of all the First Folio Exhibit venues, New Mexico is the only state where a government was operating when Shakespeare was alive and writing The Tempest. Across the street from the New Mexico Museum of Art is the New Mexico History Museum, created in 1610 as Palace of the Governors, when Spain established its seat of government in Santa Fe to cover what is now the American southwest. It is the oldest continuously occupied building in the United States. 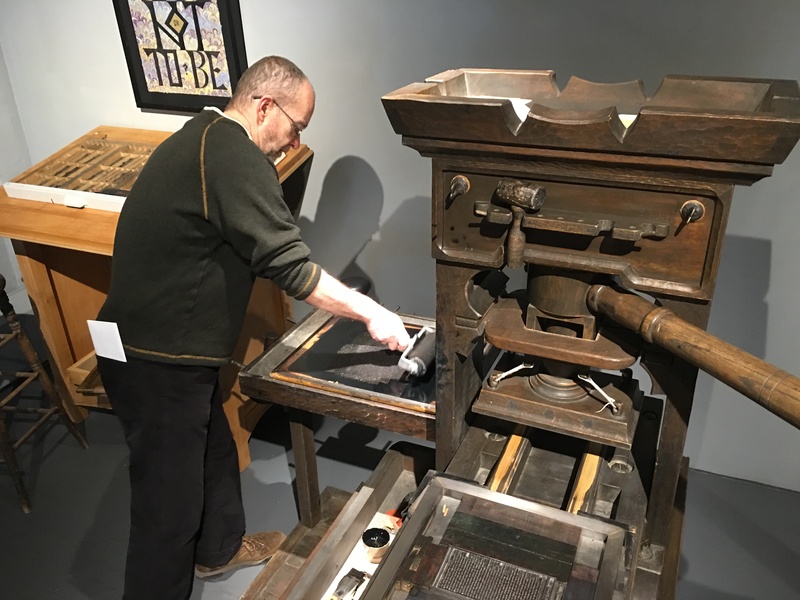 Award-winning Palace Press printers Tom Leech and James Bourland mounted a multi-part exhibit where they printed facsimiles of a First Folio page using a replica Gutenberg wooden hand press. Visitors were invited to make their own prints to take home. 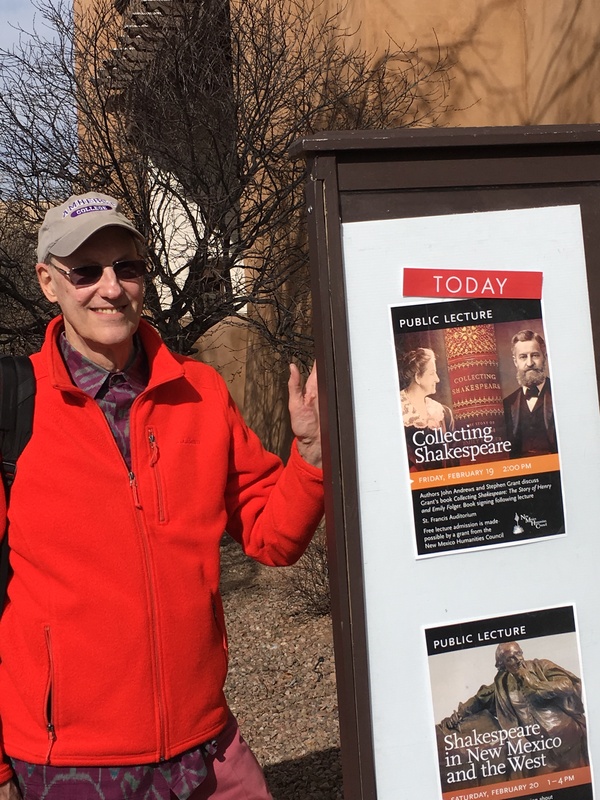 Steve Grant outside New Mexico Museum of Art before his talk to 200 enthusiastic Shakespeare addicts. In Conversation with John F. Andrews, President of the Shakespeare Guild, I spoke in St. Francis Auditorium on Collecting Shakespeare and the First Folio to 200 Shakespeare enthusiasts come from the area to catch a glimpse of the First Folio on display in an adjacent room and opened to the “To Be or Not To Be” soliloquy from Hamlet. The Shakespeare Society bid adieu to the First Folio on February 28 by performing familiar farewell scenes from Shakespeare. Stephen H. Grant is the author of Collecting Shakespeare: The Story of Henry and Emily Folger, published by Johns Hopkins. He is a senior fellow at the Association for Diplomatic Studies and Training and the author of Peter Strickland: New London Shipmaster, Boston Merchant, First Consul to Senegal. We expect Steve’s next report on the First Folio tour after he speaks in San Diego on June 22 the San Diego Public Library. 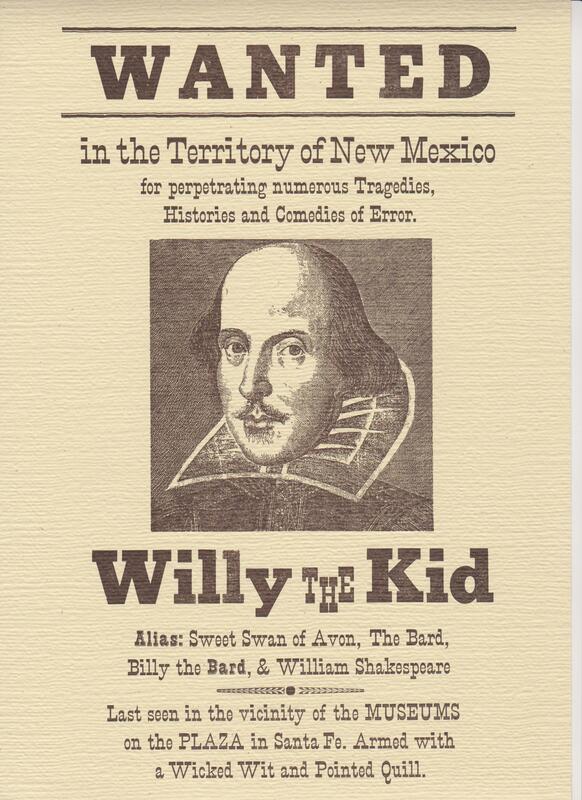 The Association of the Oldest Inhabitants of D.C.
Tom Leech designed and printed this “WANTED Willy the Kid” poster displayed in many Santa Fe store windows during the residence of the Folger Shakespeare Library’s Shakespeare First Folio. Johns Hopkins University Press released Collecting Shakespeare: The Story of Henry and Emily Folger on the Ides of March in 2014, the 450th anniversary of the Bard’s birth. In 2016, the 400th anniversary of Shakespeare’s death, the most famous and valuable Shakespeare volume––the 1623 First Folio––is on tour to all 50 American states plus Washington DC and Puerto Rico. Eighteen of the 82 copies of the First Folio that Henry Folger purchased are traveling. The institutional hosts were selected after a competitive process marked by 140 inquiries, 101 completed applications, and winning proposals from 23 museums, 20 universities, five public libraries, three historical societies, and one theater. The University of Notre Dame in Indiana opened the First Folio tour on January 4, 2016 and The Parthenon in Nashville, Tennessee will close the tour on January 2, 2017. This link to the Folger gives the information about where and when the rare volume will be displayed. The tour is an ambitious, complicated, and unprecedented project, made possible in part through the sponsorship of the National Endowment for the Humanities and Google.org. The Folger Library’s partners in organizing it are the Cincinnati Museum Center and the American Library Association. A 1623 Shakespeare First Folio open to the title-page and Ben Jonson’s preface. What is a folio? The word “folio” is a printer’s term, referring to the size of the page, approximately 9 by 13 inches. (A folio-size paper folded in half, is called a “quarto.”) When Shakespeare’s plays were printed individually, they appeared in quarto. When all his plays were posthumously published, they appeared in folio. The First Folio of 1623 is the sole source for half of Shakespeare’s dramatic production. 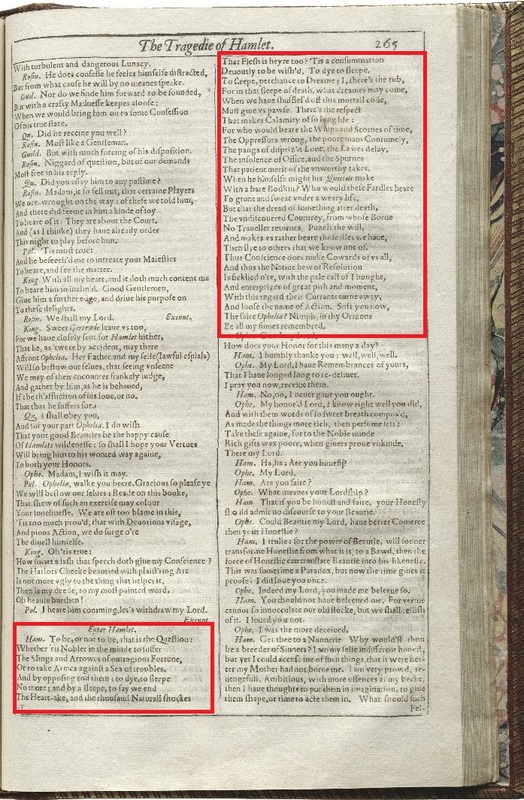 Eighteen of his plays (including Macbeth, Julius Caesar, The Tempest, and As You Like It) had never been printed before and would probably be unknown today without this early compilation. They were offered to the public unbound, with pages uncut. Due to the large-size format of the volume, and the quality of the handmade sheets of rag paper imported from northern France, the sales price was high for the times. While attending the play cost one shilling six pence; the cost of this prestigious book was one pound (twenty shillings), or the equivalent of buying forty loaves of bread. By comparison, Sotheby’s in London sold a First Folio in 2006 for 2.8 million pounds, or the equivalent of buying 125 new automobiles. A 1623 Shakespeare First Folio open to the Hamlet soliloquy, “To be or not to be.” At every location on the tour, the First Folio will be open to this page. 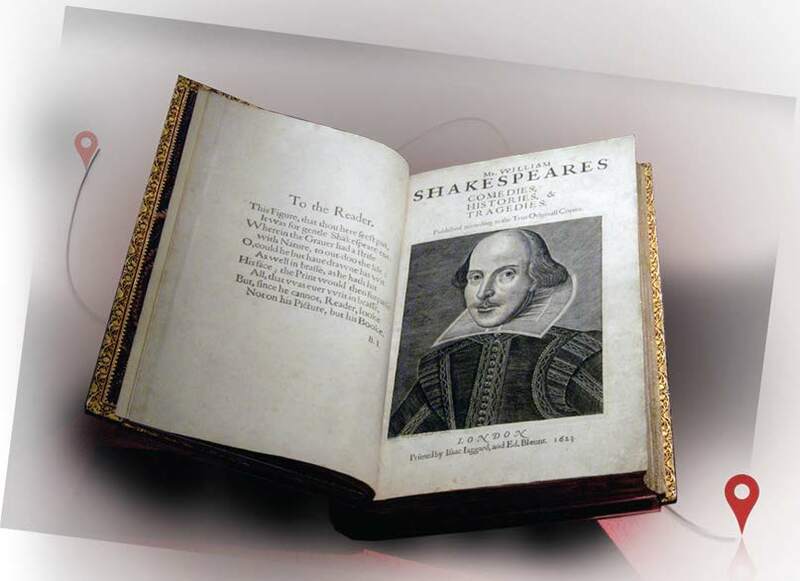 The First Folio is the most coveted secular book in the English language and one of the most important books in the world. Shakespearean scholars consider it to be the most authentic version of the Bard’s dramatic output. The original print run was about 750 copies. Only 233 copies of the First Folio are known to exist today. Why did Mr. Folger seek to acquire as many copies as he could? Every hand-printed book is unique. In the 17th century, with hand-set type, sometimes a letter wore out and was replaced. Spelling was not standardized. As many as nine typesetters or compositors worked on the First Folio in the printing shop with idiosyncrasies such that experts can identify which compositor worked on which copy. Many of the copies have marginalia (words, phrases, poems, drawings) added in the margins by avid readers over the centuries. Some assertive readers considered that they could improve upon the Bard’s English and crossed out his words and inserted their own! Main Library Koret Auditorium, 100 Larkin St.
Stephen H. Grant is the author of Collecting Shakespeare: The Story of Henry and Emily Folger, published by Johns Hopkins University Press. He is a senior fellow at the Association for Diplomatic Studies and Training and the author of Peter Strickland: New London Shipmaster, Boston Merchant, First Consul to Senegal. Use promo code “HDPD” to receive a 30% discount when you order your copy of Collecting Shakespeare. Authors are blessed when their books are published on important anniversaries. Collecting Shakespeare: The Story of Henry and Emily Folger hit the stands in the spring of 2014, coinciding with the 450th anniversary of Shakespeare’s birth in 1564. After the Folger Shakespeare Library was dedicated in 1932, four decades passed before the first biography of its founders appeared. This lapse is quite surprising when one considers that the private research library, only two blocks from the US Capitol, houses the largest Shakespeare collection in the world. The biography unlocks the key to how, during the Gilded Age, a quiet Victorian couple, together and alone, pulled off the feat from their Brooklyn brownstone. The (Masonic) Naval Lodge on Capitol Hill. During the last 18 months, I have been active in arranging speaking venues, book signings, and media events in Washington, DC, New York, Maryland, Massachusetts, Virginia, and Connecticut. In addition to four events organized by the publisher, hosts have included 13 private clubs, 12 libraries, 6 public halls, 3 bookshops, 3 private homes, 3 radio stations, 2 TV stations, 2 colleges, 1 museum, and 1 theatre. 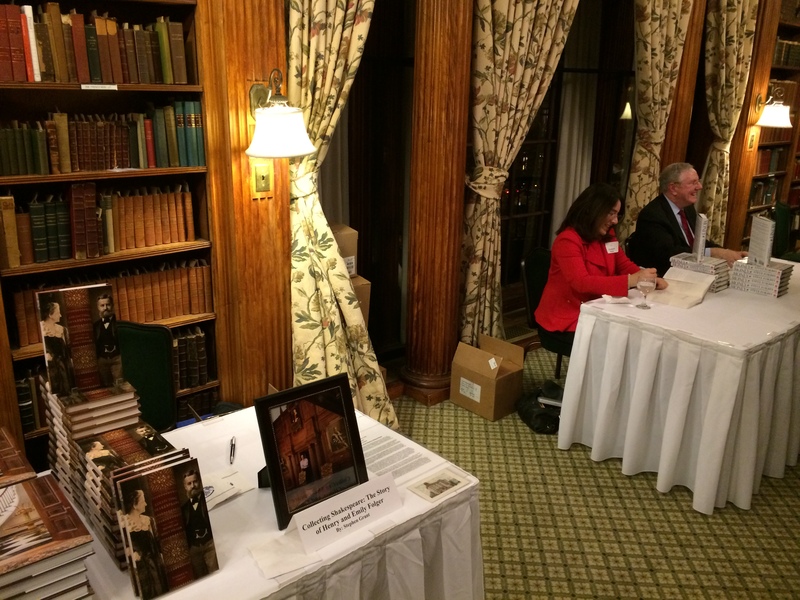 The author’s “Collecting Shakespeare” table with Steve Forbes seated nearby, at the Union League Club in New York. High points were TV performances on CBS This Morning and C-SPAN2, and peddling books at a table near Ralph Nader, Cokie Roberts, Ted Olson, and Steve Forbes (photo 2). Chagrined to find a long taxi line at New York’s Penn Station, I folded my six-foot-four frame into a pedicab and bounced along the Manhattan roadway to the sedate Union League Club. As I emerged from between two plastic flaps, the doorman eyed me warily. 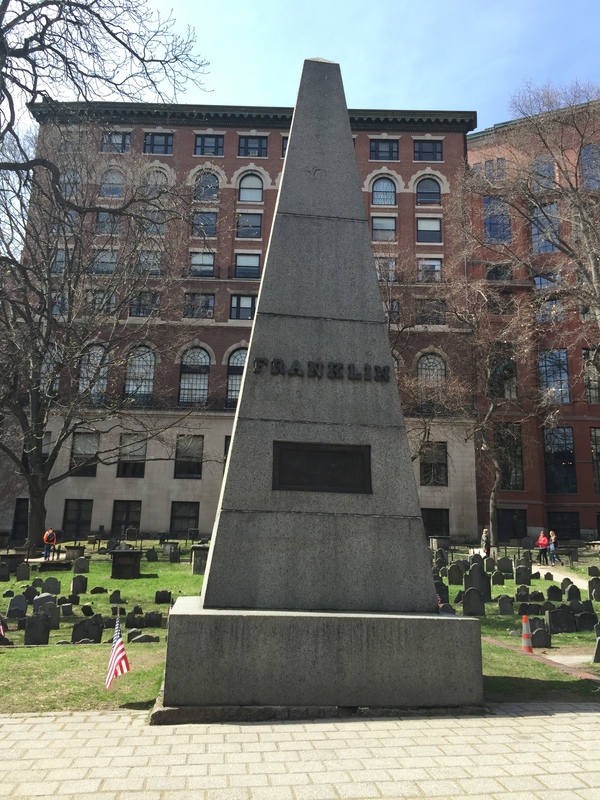 Franklin obelisk gravestone in center of Old Granary Burial Ground; behind is the Boston Athenaeum. 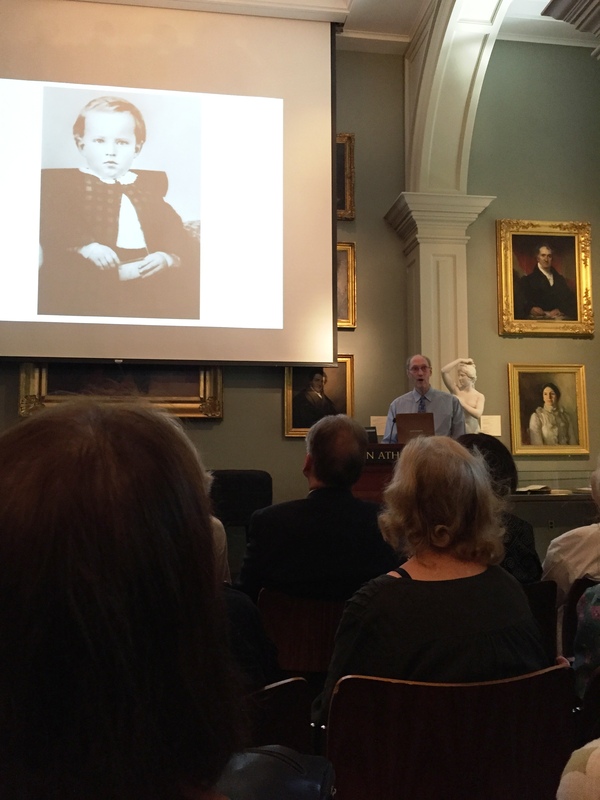 Attending the Athenaeum lecture (photo 4) was a grandniece of Henry Folger who remembers nervously reciting a poem from Robert Louis Stevenson’s A Child’s Garden of Verses at a Thanksgiving dinner at Emily Folger’s residence in Glen Cove, Long Island after “Uncle Henry” died. On screen, budding bibliophile Henry Folger grasping the first of 92,000 books he will acquire. The Theatre Library Association named Collecting Shakespeare a finalist for the George Freedley Memorial Award in 2014 in the field of live theatre or performance. Next year, 2016, marks the 400th anniversary of the Bard’s death in 1616. Gigs are already scheduled in Santa Fe, San Diego, Palo Alto, and San Francisco. Lucky author! At the 2015 Modern Language Association Convention, the journal SEL Studies in English Literature 1500-1900 won the Voyager Award from the Council of Editors of Learned Journals (CELJ). The award recognizes an outstanding journal in any discipline covering the time period between 1500 and 1800. SEL Editor Logan Browning took some time recently to participate in a Q&A about the award. JHUP: Congratulations on the Voyager Award. What does it mean for your peers to recognize SEL like this? Logan Browning: That the award comes from fellow editors of learned journals makes it especially significant. Each judge for the CELJ knows intimately how much work goes into producing a professional, respected scholarly or learned journal year after year: the difficult balancing act necessary between diligently honoring the standards of your predecessors—in our case the founders and developers of the journal here at Rice University—and remaining constantly alert for ways to improve and innovate and avoid stagnation. It’s tough in ways that only fellow editors understand fully. I’ve always joked with my family and many friends that they shouldn’t worry, that I won’t be sending them gift subscriptions to SEL as birthday or holiday presents because I realize that our audience for each issue is somewhat specialized. But I go on to say that, just as you would want your medical doctors to have read certain journals covering their specialties, we hope that scholars working in the fields we cover consider SEL essential reading. Judging our success in that regard is also something that only peers, those working toward the same goal, can accomplish effectively. JHUP: With issues covering four distinct time periods, how satisfying is it to win an award covering largely the same time period? LB: One of the persistent challenges for SEL is maintaining the same degree of excellence in each of our four issues: making sure that one issue doesn’t gather all the attention and respect while another struggles. We want the specialists most focused on each of our issues to accord us the same high level of distinction. I think this award certifies that we’re doing a pretty good job of meeting that challenge. JHUP: How has the addition of editors for specific time periods helped the journal in recent years? LB: Adding Joseph Campana as our Editor for 1500-1659 to work on our Winter and Spring issues and Alexander Regier as our Editor for 1660-1900 to work on our Summer and Autumn issues has been wonderfully helpful in a great many ways. They gives us in-house expertise across all four of our issue concentrations, the insight of two highly respected scholars whose visibility in their fields has helped to bring in a large number of new contributors and advisors from all levels of the profession. And each has generated numerous ideas for new exciting projects. Two of those ideas are already bearing fruit: Joe’s idea that more attention should be paid to allegory’s place in early modern drama has led to the publication of a cluster of essays in our Spring 2015 issue under the title “Staging Allegory,” and Alexander’s idea to highlight essays emerging from a year-long seminar at Rice on “Exchanges and Temporalities” is responsible for our decision to publish two special issues, Summer and Autumn 2016, devoted to that topic. We are thinking these special issues will help us learn more about possible ways to recalibrate our standard division of issue focus at SEL, but stay tuned for more on that subject. I am immensely proud of having had the idea of adding two in-house editors, especially as it has thus far worked out so well for the journal to have Joe and Alexander on board. But I do have to acknowledge that I first thought of the possibility when I was reading correspondence in the SEL archives to write a short history of SEL for our 50th anniversary celebrations in 2010 and 2011. I discovered then that Carroll Camden, the founding editor of SEL, had originally hoped to have an editor in place for each issue, but the idea never quite panned out. But it showed me, that in this and so many other ways, his first outlines for the journal in the late 1950s were inspired. So much of what we do today at SEL has been in place from the very beginning. JHUP: This is the second CELJ honor in recent years with Bob Patten winning the Distinguished Editor honor in 2013. How gratifying is it to receive these kinds of recognition? LB: Both have been gratifying to receive, but in different ways. Bob’s award acknowledged, among other achievements, the fact that no one has had more influence on the continued success of SEL and its comparative security in the very insecure world of scholarly publishing than he. Despite the respect I have for Carroll Camden as founder, as well as for others such as Ed Doughtie, also journal editor at a key time, I would argue without any doubt that Bob’s work with SEL for more than thirty of his forty years at Rice makes him the most significant figure in our history. Almost every day, I think of some way that Bob’s prescience and persistence make my working life easier. Without him, SEL almost certainly wouldn’t exist today. He found fiscal support in unlikely places, organized our wonderful Diana Hobby Fellows editorial program for Rice graduate students in English, set up arrangements with Johns Hopkins University Press and Project MUSE that continue to pay off for us today, secured the digital archiving of our issues from the first volume on with JSTOR, and maintained an absolutely stellar editorial board of advisors from around the English-speaking world. He also left a superb example of selfless scholarship and professionalism. JHUP: What kind of effect do awards have on the people who put in the extra time required to put out an outstanding journal? LB: Immeasurable. And I’m not trying to be hyperbolic here. I think virtually everyone who works in scholarly publishing knows that you aren’t going to become a celebrity in this world. Even of those who may publish a blockbuster book, or lead discussions on highly topical issues, only a very small number will ever be “trending” or merit attention outside a small coterie of professionals with similar interests. So when a journal like ours receives some recognition, e.g., wins a Voyager award, it feels and, I think, is immensely significant. Consequently, it’s extremely important to point out that such a rare honor truly is a collaborative effort; that lots of dedicated persons have contributed to the qualities that earned the award. It’s not just the publishers and executive editors, the editors, and the editorial board, but (to give only a partial list) the associate editors and business managers of the last twenty-five years such as Becky Byron (currently), Kay McStay, K Krueger McDonald, and Sally Hubbard; the Hobby Editorial Fellows; the scholarly essay contributors; our omnibus review authors; the specialist manuscript evaluators; our readers, especially those who remain loyal subscribers; the superb staff members at JHUP; and of course our benefactors, particularly the Hobby Family Foundation and the School of Humanities at Rice. It’s been a great honor to accept the Voyager Award on behalf of everyone who has helped to make SEL the distinguished journal that it is. Here are three things to remember about Henry Clay Folger on his 158th birthday, June 18, 2015. One. 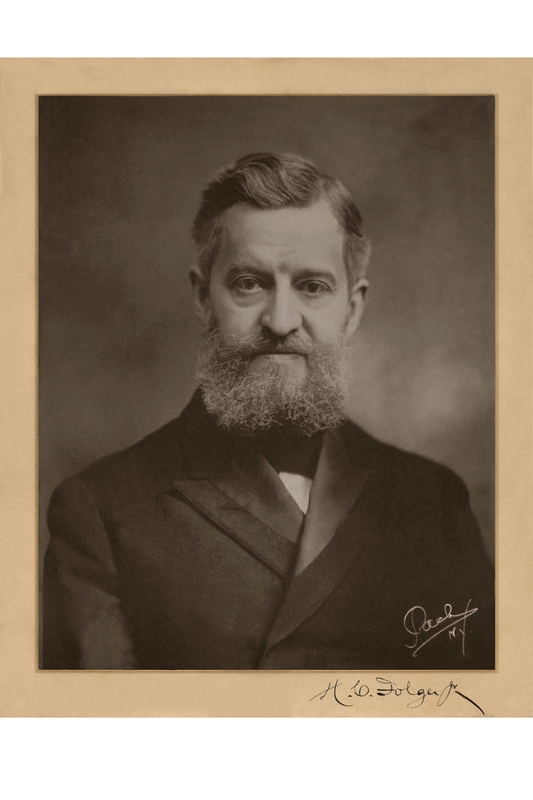 The most astounding single fact about Henry Clay Folger (1857–1930) is that he made his way to the very top of two distinct lines of endeavor. From 1879 to 1928 he climbed the ranks at Standard Oil Company from statistical clerk at age 22 to CEO of the largest, most successful petroleum business on the planet. AND he assembled the largest collection of Shakespeare items in the world. His doctor of letters degree from Amherst College cites “his services in the affairs of a great empire of industry whose produce is on every sea and its light on all lands and for his knowledge in the most important field known in English literature.” John D. Rockefeller sent Folger this wry message: “I congratulate you upon receiving the degree, and that your connection with a great and useful business organization did not detract from your high standing.” Even more to Folger’s credit was that he was not born into wealth. He needed a loan from classmates to complete his college education. Two. Henry Folger’s most erudite, persistent, and successful bookseller, Dr. A. S. W. (Abraham Simon Wolf) Rosenbach of Philadelphia, called Folger “the most consistent book collector I’ve ever known.” What he meant by that phrase was that Folger kept his eyes on the prize. Folger bought virtually anything and everything by or associated with Shakespeare that he could acquire–as long as the price was right. Folger drove a hard bargain, such as insisting on ten percent discount when he paid with ready cash. Corresponding with 600 book dealers, 150 in London alone, Folger shared with them why he rejected a book offer or sent it back upon examination. Many times it was because the item was not “Shakespearean enough.” He was training them to go out and seek more and better items for his library. Toddler Henry holding a book. Dr. Folger holding a book. Evidence of Henry’s consistency appears even in how he held a book. The above portraits produced 67 years apart reveal his loving two-handed grasp. Three. Henry Folger was a very private man. He kept no diary, gave only one interview. His postcards home while on a business trip out west sent from “Henry Clay Folger” to his wife “EJF” revealed “All in fine health and spirits.” He used shorthand for many personal notes. He signed his book cables “GOLFER.” He bought property without his name appearing on the deeds. He entreated his booksellers not to divulge what he paid for his antiquarian book purchases. His greatest glee was keeping from the world how many First Folios he owned. Lawrence (Larry) Fraser Abbott and Walter (Crit) Hayden Crittenden were two Amherst chums he confided in. They had done the same things Henry had: won a prize in oratory, written for the student newspaper, sung in a fraternity quartet, earned a law degree. Crit wrote, “Mr. Folger was by nature a very shy man, almost bashful. He avoided all possible meetings and conventions, or in fact any form of gatherings, due to his shyness. It was therefore the privilege of but a few to know him intimately.” H.C. wrote to Larry, “I presume no one is better informed than I am about the value of Shakespeare literature.” Folger would not have shared that claim with just anyone. Only with Herbert Putnam, Librarian of Congress, did he share–the year he died–that he wondered if he would have his biography written some day. 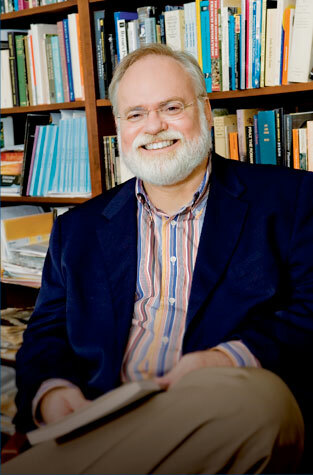 Stephen H. Grant is the author of Collecting Shakespeare: The Story of Henry and Emily Folger, published by Johns Hopkins. He is a senior fellow at the Association for Diplomatic Studies and Training and the author of Peter Strickland: New London Shipmaster, Boston Merchant, First Consul to Senegal. Comments Off on Happy Birthday, Henry Clay Folger! 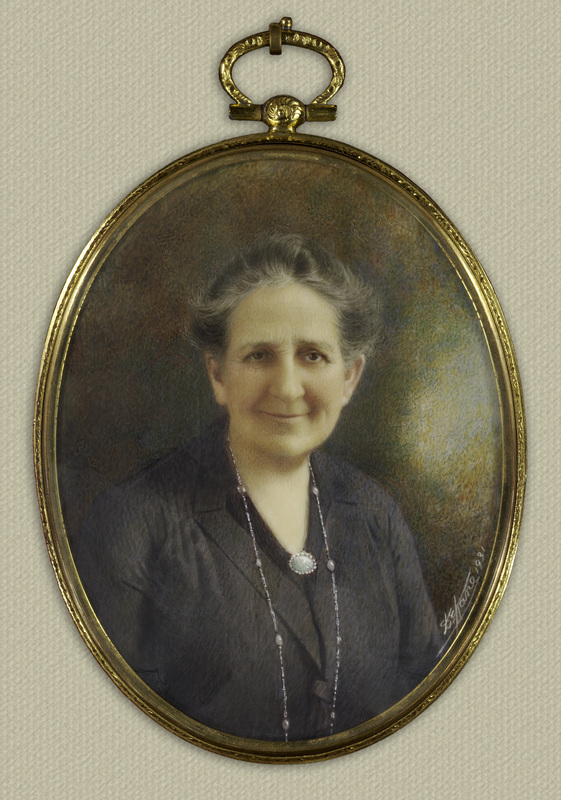 Emily Jordan was born in Ironton, Ohio on May 15, 1858. 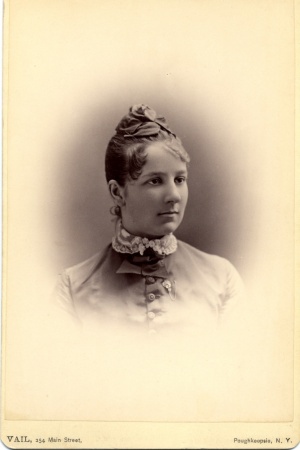 Following her two older sisters to Vassar College, she emerged a bluestocking: a refined lady with intellectual, scholarly, and literary interests. Emily’s Vassar 1879 class of 36 students elected her class president for life. Although her undergraduate scrapbook attests to a few dates with nearby West Pointers, she met her husband to be in Brooklyn at a literary salon in the home of Charles Pratt, founder of the Pratt Institute. Henry Folger also graduated in 1879, from Amherst College, where he roomed with Charles Pratt Jr. Both Emily and Henry earned Phi Beta Kappa keys. Neither Emily’s nor Henry’s parents attended college. Emily took one of the few jobs open to young women, teaching. She taught in the collegiate department at the Nassau Institute—Miss Hotchkiss’s school for young ladies—in Brooklyn. When she married Henry in 1885, she was obliged to give up her teaching job. For the next half century, Emily served as a full partner in one of the most prodigious literary feats of all time: assembling the largest collection of Shakespeare in the world. Henry Folger corresponded with 600 booksellers, 150 in London alone. The underground vault of the Folger Shakespeare Library contains 258 linear feet of auction catalogs which arrived at Henry’s office, 26 Broadway in Manhattan, home of the Standard Oil Company where he worked for five decades. When he brought the catalogs home to Emily in their Bedford-Stuyvesant brownstone, her job was to identify the items she wanted in their collection. Henry put together a bid list, and paid for the winning lots from his oil fortune. Then Emily wrote up each item for the card catalog, developing writer’s cramp along the way. A childless couple, the Folgers were singlemindedly devoted to the Bard. They received family only twice a year: Thanksgiving and January 1. Nieces remember that on these sparse occasions, their aunt expected them to recite poetry and rewarded them with a book with a five-dollar bill tucked inside. The Folgers attended no social events nor hosted any business dinners. When they went on vacation in Virginia, they lugged a special travel card catalog around with them. On their numerous voyages to England, they attended Shakespeare performances, went book hunting, and brought back poppy seeds from Stratford-upon-Avon. 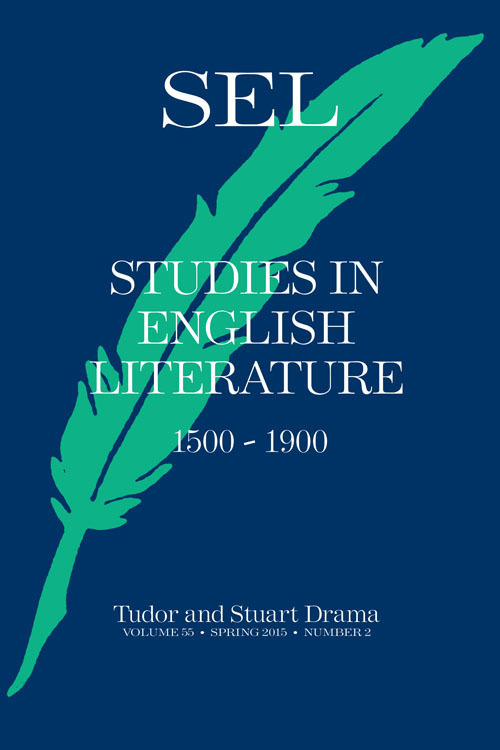 Emily was a close adviser to her husband in the acquisition of eighty-two Shakespeare First Folios, the 1623 compilation of thirty-six plays, eighteen of which might have been lost to the world as they had not been printed. Emily had earned a masters degree at Vassar with a thesis on “The True Text of Shakespeare,” pointing to the 1623 publication as the most authoritative edition of the plays. Emily kept a fascinating play diary, where she wrote pages and pages of detail concerning the 125 Shakespeare plays she saw in her lifetime. In 1919, the Folgers started buying up the fourteen redbrick rowhouses two blocks from the U.S. Capitol on land they had identified for a permanent repository for their Shakespeare collection. Each of the deeds noted Emily Jordan Folger as owner. She also held in her name bank vault and storage warehouse accounts where they stored books, manuscripts, playbills, prints, engravings, paintings, pieces of furniture, porcelain, armor, maps, charts, phonograph records, costumes, globes, musical instruments, and curios. Henry stayed beneath the radar. In the late 1920s the Folgers continued their aggressive buying of Shakespeare items, but made the time to help design what would become the Folger Shakespeare Library with French-born architect, Paul Philippe Cret. They selected quotations to be etched in stone. They identified scenes from Shakespeare’s plays for relief sculptures on the library façade. It was Emily’s Day on April 23, 1932, the 368th celebration of Shakespeare’s birthday, when, wearing a shoulder corsage of orchids, and lilies of the valley over her academic robe, she turned over the keys of the Folger Shakespeare Library to the chairman of the board of Amherst College, who was responsible for the administration of the Folger. Henry was not present. He had died suddenly two weeks after the cornerstone was laid. He had never seen one stone of his library. He had never seen all his books and Shakespeare treasures assembled together under one roof. Seamlessly, Emily took over the mantle to make the research library a reality. She died in 1936. The Folgers’ ashes are in urns behind a bronze plaque in the reading room. The Folger is a library, a theatre, and a mausoleum. Jane Austen was born on December 16, 1775, in Steventon, Hampshire, England. Today, on her 239th birthday, Austen’s life and work continue to attract enormous world-wide interest. 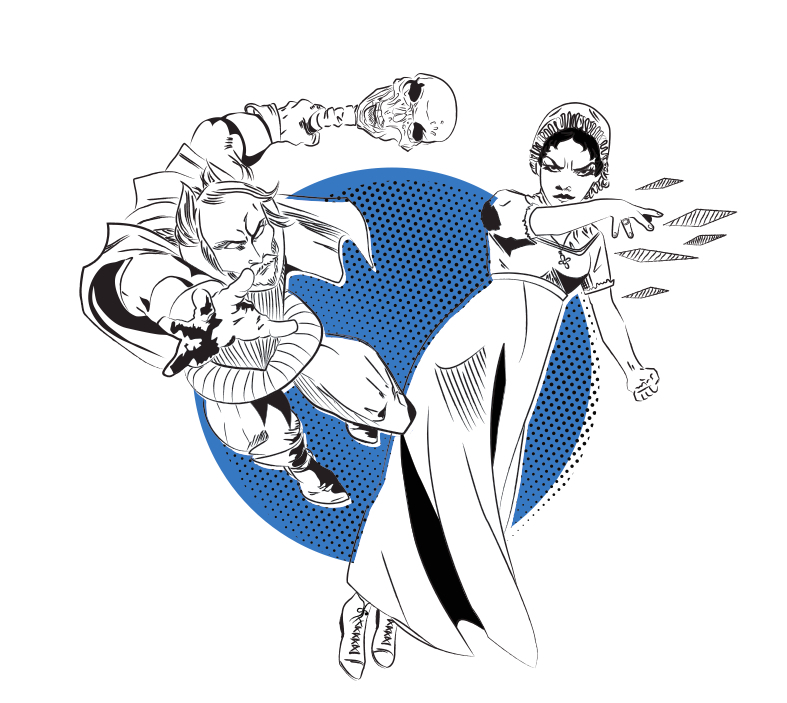 In 2016, the Folger Shakespeare Library will host an exhibition called Will & Jane: Shakespeare, Austen, and the Cult of Celebrity, exploring how these writers became literary superheroes. The exhibition will be co-curated by JHU Press authors Janine Barchas (Matters of Fact in Jane Austen: History, Location, and Celebrity) and Kristina Straub (Domestic Affairs: Intimacy, Eroticism, and Violence between Servants and Masters in Eighteenth-Century Britain). Congratulations, Janine and Kristina: we’ll see you at the Folger! For now: Happy birthday, Jane! Comments Off on Happy birthday, Jane Austen!